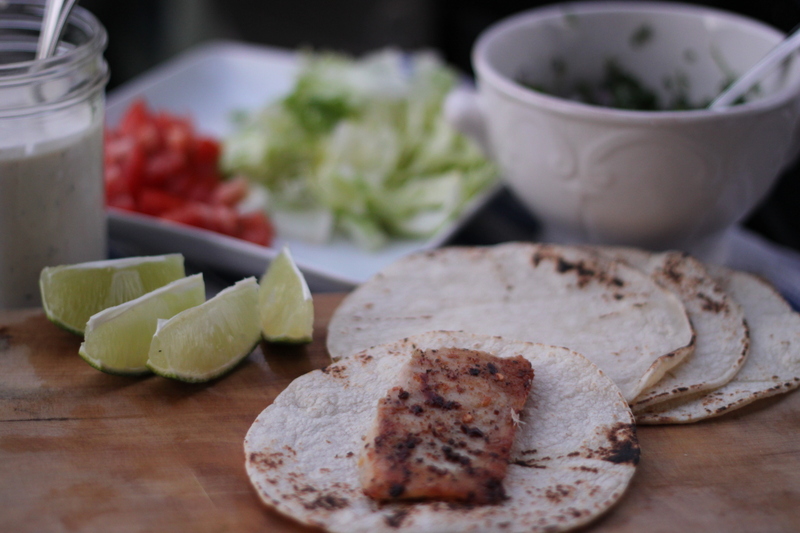 One of my favorite things to make on weeknights are grilled fish tacos. They are also one of my favorite things to make when feeding a crowd. They are fresh, easy, healthy and I don’t have to spend forever in the kitchen cooking and doing dishes. I have found that the best way to serve this is to bring all the elements out next to the grill for people to just build their tacos while standing around the fire. There is something awesome that happens when table cloths are left folded away and knives and forks are left in the drawer. Don’t get me wrong, I love formal dining and make a production of my table décor and setting at every opportunity but a big part of me just loves standing around outside, eating, drinking – completely informal, completely relaxed. So with that said, take a look at dinner last night. The star of the show – the fish. 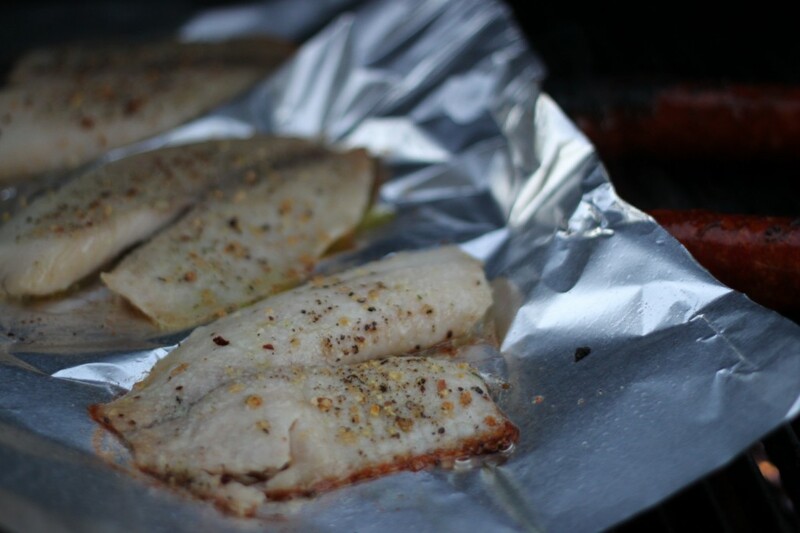 I usually use Talapia for my fish tacos because its readily available and somewhat inexpensive – in my opinion, there is no point in putting an expensive piece of fish in a situation i.e. 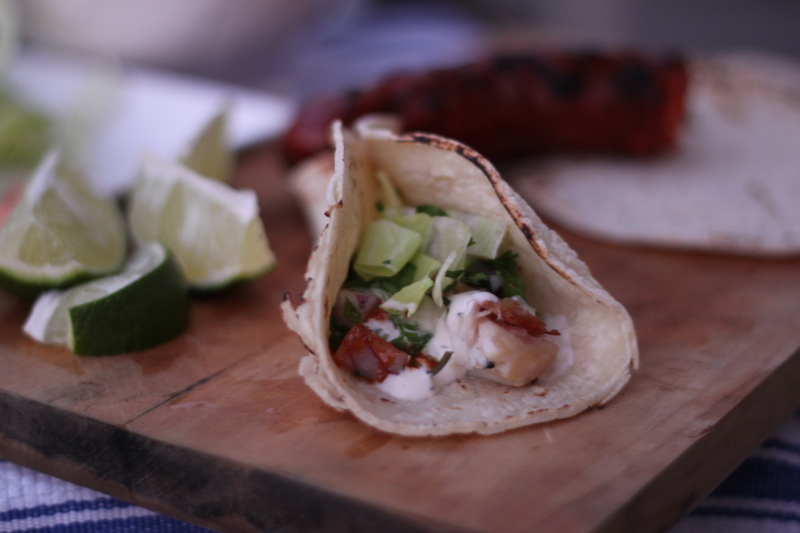 taco where a lot of its flavor is going to be mingled with other equal if not stronger flavors, it really should be the star of the show. Talapia is actually a freshwater fish from Africa. The US gets a lot of their Talapia from farms in South America these days. Talapia is generally thought to be an invasive species in the wild. Okay, now that I have gone on and on about the fish, here are some more details about the process. I season them up with lemon herb mix, garlic salt, fresh lemon juice and a little bit of olive oil. I put them on the grill on a piece of foil because its easier to break it up into chunks later for the tacos. You have no idea how many things I have lost down in between the grate of my grill. I cook them on medium-high for about 8 minutes each side or until they are opaque. No, your eyes are not deceiving you – there is a sausage on the grill as well. Actually, there are two. Portuguese Linguica. I love grilled sausage. Like, I really, really love it and I take any opportunity to throw them on the grill. I bring a cutting board out so people can just slice off a hunk of sausage anytime. The fixings – lettuce (I prefer cabbage but I have like 3 heads of Iceburg I’m trying to use up – darn Costco), tomato, cilantro onion mix, lime wedges, corn tortillas, Tapatilo or some other hot sauce/salsa and my baja dill yogurt sauce. For those of you who live in Los Angeles like me, there is this chain of food joints called Rubio’s. They serve Baja inspired Mexican food. They have these beer battered fish tacos with cabbage, salsa and this ridiculous white sauce which is the inspiration for my baja dill yogurt sauce. I don’t have the exact recipe for it but I’ve managed to get pretty close – 1/2 cup yogurt, 1/2 cup mayo, 1/4 cup buttermilk, 4 minced garlic cloves, 1 teaspoons of dill, pinch cayenne, pinch smoked paprika, 1/2 teaspoon coriander, 1/2 a lime and salt to taste. I serve it in a mason jar and it should keep for up to one week in the fridge. I built one to show you. Here is a closer look. I have to say, they were so good – I had to cut myself off at two. 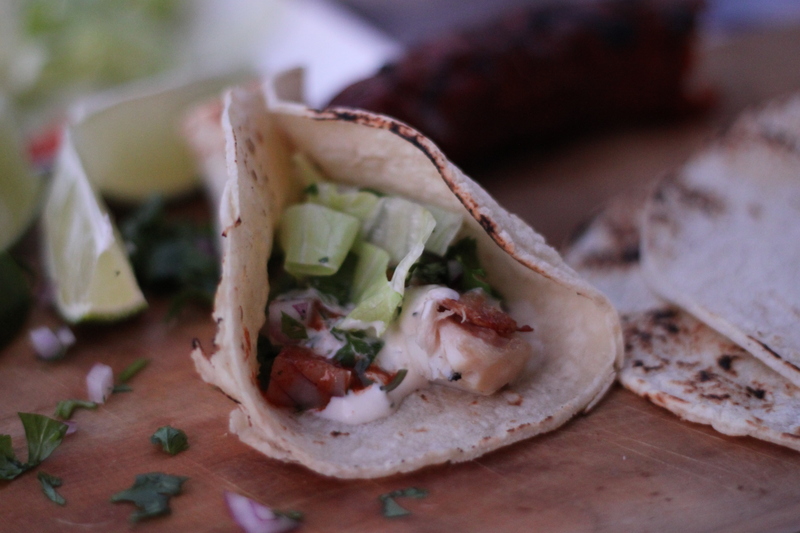 I hope you get a chance to make these super easy fish tacos while its still warm outside.